In a metal bowl over a pot of simmering water (a double boiler) melt the chocolate, butter and vanilla. Be sure not to burn it, so pull it off the heat when there are a few small pieces still visible. Continue to stir off the heat until smooth and let cool to room temperature. Slightly warm the 1/4 cup of cream and add the gelatin. This should not be hot just very slightly warm. Let bloom (melt) for about 10 minutes. Fold into the chocolate mixture. Then fold the whipped cream into the chocolate mixture until just incorporated. Chill until ready to serve. 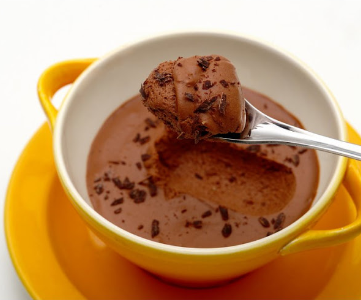 If you want to serve this in individual glasses, place the mousse into the glasses before chilling.